The Coaltion Government is corrupt to the very core – the Earth’s core. The short termism of their policies is evident, plunging from disaster to disaster with no care for the damage inflicted to individual people’s lives as the welfare state, our NHS and public services are being demolished. They look no further than their own self interests. The Independent reveals why, against all warnings, they choose to pursue a policy to release shale gas from fracking. The industry bosses have infiltrated our government ensuring the policies work to their own best interests. Cuadrilla, which is chaired by Lord Browne, is searching for shale gas in Lancashire, but suspended operations there in 2011 after its drilling was found to be the likely cause of tremors in Blackpool. The Government has signed up to the potential of shale gas after it transformed energy policy in the United States, despite severe criticism from environmentalists. It is very timely that Ed Miliband is bringing party funding onto the agenda. Also, that members of parliament should not have other paid employment or interests which conflicts with their parliamentary role in representing their constituents and the best interests of the British people – and those abroad. The independent questions whether the Coalition can be trusted to serve our interests or their own or their cronies. The former BP boss is chairman of Cuadrilla, which is exploring for shale gas in Lancashire and West Sussex. He is lead “non-executive” across Government, meaning that he helps recruit other non-executives to Whitehall. The non-executive for the Treasury sits on the board of BG Group, which has significant shale gas assets in the United States. The non-executive to the Transport Department is also chief executive of British Gas owner Centrica, which recently bought a 25 per cent stake in Cuadrilla’s most promising shale gas prospect. A former executive at BP when Lord Browne was at the helm, he followed the peer to Riverstone Holdings, which owns 42 per cent of Cuadrilla. Moxham was energy adviser at No 10 but quit in May. George Osborne’s father-in-law is also president of the British Institute of Economics, whose backers include BP and BG Group. The latest revelation is that Mr Cameron’s own aide, Lynton Crosby, has been linked to the fracking industry, renewing pressure upon the prime-minister to sack his party elections adviser. The association’s members include Dart, the company behind coal-bed methane extraction in Scotland, which holds a fracking licence. George Osborne announced tax breaks for the oil and gas industry just weeks after Mr Crosby’s appointment as a Conservative adviser was announced. The same old Tories …. perhaps you recall this scandal when Greenpeace’s undercover reporter has taped senior Tories openly acknowledging the ‘plot’ to undermine the coalition agreement on tackling climate change. In the recorded interview, Peter Lilley is clearly heard recommending that the Secretary of State for Energy and Climate Change, Liberal Democrat Ed Davey, should be the focus of anti-windfarm attacks, and agreeing that George Osborne would sanction such undermining. At least seven people were injured, four of them very seriously, after an explosion at a hydraulic fracturing operation at a gas well drilling pad in Doddridge County early Sunday morning, according to emergency officials. The media’s insistence that renewable energy would not satisfy our needs literally fuels the thirst for fossil fuels, and nuclear, while denying the dangers of climate change and nuclear contamination. The financial argument in favour of fossil and nuclear fuels is heavily biased, distorting political and public confidence in renewable energy. Why is George Osborne insisting on commitment to dirty, carbon producing gas-fuel for years to come? Ed Davey has been pressured by George Osborne to adopt gas or face deep cuts to any renewable subsidy. (Friends of the Earth, ) Furthermore, there is evidence that the energy companies manipulate markets, Libor style by fixing prices. 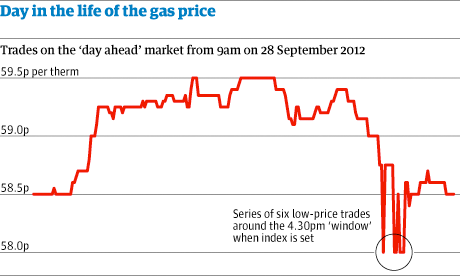 The Guardian reports on how gas prices have been fixed. Why is the government prepared to invest in fracking and shale gas, with known dangers, whilst cutting the feed-in-tarrifs for micro generation projects? Why has investment in renewable energy in the UK been curtailed? Why has investment in gas been expanded? Why has the price of gas been manipulated? Who is benefitting from increase in the global gas prices? Rather than questioning whether Ed Miliband is weak or strong in considering whether MPs should have multiple jobs, and whether union members should opt in to Labour, we might ask to whom David Cameron is answerable, to the British people or the gas corporates and the bankers. We might wonder even if he had any integrity as the acting prime minister, whether he holds power to overcome the plutocratic powers that impose their will on the world’s people. Damage to the country, damage to the world’s climate, the planet itself… none of this is at the forefront of this coalition. It is time for this government and their short termism, blinkered view to be put aside and a new government replace them leading a new Green recovery with investment in renewables, and jobs for everyone. This time, there really is no alternative. This entry was posted in Uncategorized and tagged BG Group, Cuadrilla, fracking, George Osborne, Lord Browne, Lynton Crosby, Member of Parliament, Riverstone Holdings, Sam Laidlaw, United States by Pamplemousse. Bookmark the permalink. Thanks, Juli – that’s very kind of you! >**The media’s insistence that renewable energy would not satisfy our needs** literally fuels the thirst for fossil fuels, and nuclear, while denying the dangers of climate change and nuclear contamination. It’s not just the media though. Ask the scientists and engineers that work with energy generation and storage technologies and you’ll get a similar answer. In fact a lot of very smart people have been looking at these sort of issue for a long time, the major complication being how to effective store energy to make intermittent sources viable. It’s a hard an yet unsolved problem. Not to say that those problems won’t ever be solved or there shouldn’t be investment in renewable technology. It’s just very hard to see how that’s going to happen when UK wide energy storage is measured in minutes rather than days with the largest completed offshore wind farm averaging less than 200MW (For reference Hinckley Point C EPR will be 3200MW).